← Would You Give Up Facebook For A Week? The Crochet Crowd wins Silver Play Award from YouTube. I just found out yesterday that The Crochet Crowd won a Silver Play Award from YouTube. I cannot tell you how much it means to Cathy and I to win this award. The hours involved in working with YouTube reaches into the 10’s of thousands of hours to do what we have done. Though I produce the videos and ect, our Cathy, helps as many people as possible with comments and etc. There is no possible way for me to run this on my own as we are about to topple 200,000 subscribers on YouTube. To put into perspective, our posts on Facebook reaches from 800,000 – 1.4 Million people who view our content in just a 7 day period. For a little team that we have, we are running virtually a metropolitan of traffic all focused on crochet. It is phenomenal to think that crochet could be this exciting. Personally, crochet has always been exciting but it’s nice to have a dedicated community to celebrate that fact each day. 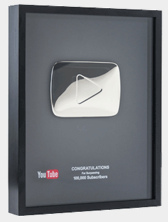 This is our 2nd Major Award with YouTube. We won in July 2012 for the On The Rise Program. This was our winning video below. It will take you on a mini journey of The Crochet Crowd. For our entire team, this video touches our community, touches our charitable hearts and reminds us of the work we have done. I tear up when seeing this video. This entry was posted in Announcements and tagged Award, crochet crowd, Michael Sellick, Mikey, Silver Play Award, YouTube. Bookmark the permalink. Congrats Michael & the rest of the crew! But dang it; I didn’t need to cry this morning😉 The video re your first award brought me to years also! So proud & happy to be part of the community! Thanks ever so much!!! Cathy, you Mikey and Diva Dan are an awesome team. I learned how to crochet from the crochet crowd. I want to say congrats to you 3 for a wonderful job. Have a wonderful day. Congradulations! Your an awesome crochet teacher keep up the good work. Your tuitorials are the best. Have a wonderful day Mikey and diva Dan. Congrats! You do such an awesome job and are VERY deserving of this award!!! Congratulations Mikey and Cathy on your well deserve award, you have done a magnificent job. Ellen, I cannot tell you how much your post touched me! I hope that Mikey will come back and read it again and again whenever he is down. What an inspiration you are! You have not let illness get you down or stop you from being a productive, contributing member of society and you are giving in your own way – how WONDERFUL! And you are one person. One example of what is possible. I know there are many others (myself included) who have learned and had an impact on others (not to mention being better people ourselves because we’ve stretched beyond our limits to learn something new with his help). I learned some of the basics years ago, but have learned a LOT more in the past 12 months simply from the Internet and much of it from Mikey and his marvelous “how to” videos. Last winter, I was leading a group of people from my church is making scarves to send to an orphanage in Swaziland (near South Africa). Folks could knit or crochet the scarves. They didn’t have to follow any particular pattern. I had several ladies who didn’t know how to knit or crochet who wanted to learn, so I got on the Internet to see if I could find any “how to” videos for them and/or free patterns for them. That’s how I found Mikey and started sharing his videos with others – what a blessing! This is and amazing story it reminded me of my mom when she was home ridden. I use to tell her mom you need to crochet to keep your mind off of other things. I know if she would have learned how to crochet she would have loved it. But she is gone now. But this story really touched me and I hope Mikey and the crochet crowd read this touching story. And congrats to Diva Dan, too! The man behind the scenes giving much support! Mike, Dan & Cathy are deserving of this award! You do great work! Yay! This is awesome! I know that I, personally recommend your channel all the time.